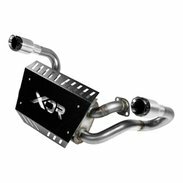 This new XDR Competition single exhaust system for 2016-19 Polaris RZR XP Turbo and XP4 Turbo is constructed from 304S stainless steel for good looks! Industry leading companies, B&M Racing and Flowmaster have joined forces and are proud to introduce our new Powersports division: XDR – Xtreme Dirt Racing. All XDR performance products have been painstakingly designed for the ultimate in off-road performance. Developed to address specific weaknesses of the most popular side by sides, XDR products not only provide a performance advantage, but also eye-catching good looks that let people know you’re serious about the quality, strength, performance and reliability of your rig. 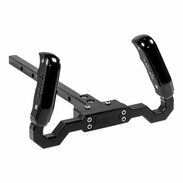 The initial release of XDR products have been specifically designed for the Can-Am Maverick X3, Polaris RZR and Yamaha YXZ1000R. Our new product line-up includes both “Forestry qualified” and “Competition only” slip-on exhaust systems, gated race shifters with lockout features, Delta Boost performance tuners, grab handles and more. We are fully committed to developing industry leading products which we feel are all necessary tools for providing the ultimate in performance for your side by side. Developed to address specific weaknesses of the most popular side by sides, XDR products not only provide a performance advantage, but also eye-catching good looks that let people know you’re serious about the quality, strength, performance and reliability of your rig.